Just when you thought Subaru couldn't get any better... the all-new, most adventurous, most reliable, safest, best Subaru Outback ever was just revealed to the world at the New York International Auto Show. The 2020 Outback features standard Symmetrical All-Wheel Drive with up to 33 miles per gallon. Upgrades to the 2020 Subaru Outback include safety improvements, capability, comfort and technology, a new tablet-sized high-resolution touchscreen interface, and for the first time ever, Subaru DriverFocus Distraction Mitigation System. 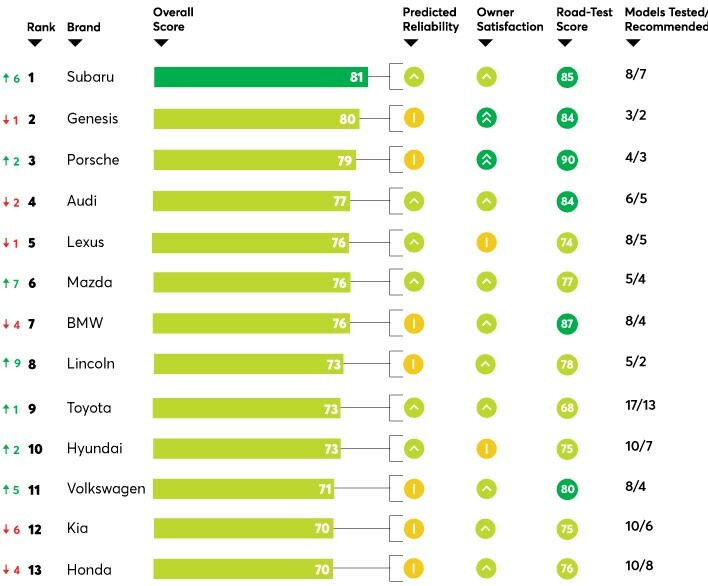 Subaru is the best brand according to Consumer Reports! According to Consumer Reports, Subaru’s strong predicted reliability and owner satisfaction marks drove it to the head of the pack. The Turbo Is Back in The Subaru Legacy! BREAKING: The turbo is back in the Subaru Legacy! Here is the all new 2020 Subaru Legacy at the Chicago Auto Show. The 2020 Subaru Legacy will be built on the New Subaru Global platform which is 70% more ridged making the new Legacy the quietest and best driving Legacy ever designed. Safety has been an upmost priority for the Subaru brand especially in 2019 with introduction of EyeSight Driver Assist Technology and LED Steering Responsive Headlights. So you are probably looking for the perfect mid-sized crossover for your family. And on your quest for the best, you've considered the Subaru Ascent, Honda Pilot and the Toyota Highlander. Great options! All are fantastic vehicles, but as you know, you can only choose one. Here's everything you need to know about the Subaru Ascent vs the Honda Pilot and Toyota Highlander. With winter in full swing, you probably rely on your Subaru's all wheel drive system to get you around. And that confidence definitely helps when traveling over our local mountain passes. But according to the Washignton State Department of Transportation, for the past several years, more than half of the closures on I-90 Snoqualmie Pass have been due to vehicles ignoring a chain-up requirement and then getting into collisions and blocking lanes. The Subaru Share The Love Event is back! Over the last few years, we have partnered with Subaru of America to donate over $315,000 to the Renton Schools Foundation Friends of Renton Schools. Last year we donated over $80,000 and we are on track to donate even more this year! Subaru Forester Named "Best Car to Buy 2019"
The all new 2019 Subaru Forester is here! And it's going to be a hit at Walker's Renton Subaru. Get excited Subaru enthusiasts! Subaru recently announced that Subaru Tecnica International (STI for short) will be debuting an American bound S209 at the North American International Auto Show in Detroit on January 14th 2019. The S209 will be the most powerful, best-handling and most exciting Subaru Tecnica International model ever created.